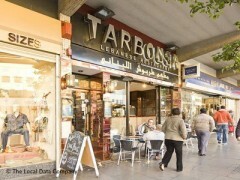 About: Tarboush serve a variety of Lebanese dishes at their air conditioned restaurant to eat in or take away. Catering for vegetarians is also provided. Best lebanese on Edgware Road. We had thé lebanese feast which is impressive. Thé kebabs are thé best and especially thé lamb cutletts. Very succulant. Thé mezza is perfect. Will go back for sure. I just took the challange as there were so many negative reviews bout this restaurant. I went with an open mind to discover by myself. Acually, the food was very good. The homous very smooth, wine leave were lemony and dellicious and the grills were succulant and perfect. We had a good bottle of french wine as we knew little about lebanese wine. Everything was O.K and the staff were also polite and friendly. We paid about 25 pounds each and I thought it was good value. It is definetly worth a try. Hi everyone,only quick message for you who you are planning to go eat to that place,don' t do that mistake.This is probably one of the worst place to go.I have been there today with 2 friends of mine and we were completely disappointed with attitude of staff and manager who was very unfriendly.We asked to avoid service charge but no way even we were not happy at all.They didn' t want to do it.I am telling you this place is not where you would like to enjoy welcoming d atmosphere,be ready to pay a lot even you will be not happy with service.I won' t be back,never ever.I thought there are some rules,your customer is your boss but unfortunately not in that place.There was only one thing which we like,the food, but restaurant was empty for Saturday night,that's mean a lot.Good luck for everyone who will go there!!!! one of the worst restuarants we have ever been to. The service was slow and unfriendly and the waiters seemed uninterested in what you asked them. After we were seated we had to wait ages for the menu, even though the place was empty but for an one more customer and it was a saturday. We again had to wait for our food to arrive which was not very nice at all after haveing to pay the extra charges and the service charge we couldnt get out of the place fast enough. A REALLY HORRIBLE EXPERIENCE- DO NO MAKE THE MISTAKE WE DID JUST STAY AWAY. Overpriced, staff not at all friendly or keenly helpful . Very quiet for a Friday night, guess that should have been a warning. Food average and definately not worth the money we paid. The seats are well worn and the bathroom not cleaned . Just wait until you question the cover charge of £1.50 per person as well as the Service Charge of 12.5%. Look, I dont mind paying tips, I always aim for 10% if the service is good and less if not . When I questioned the manager, he showed me a tiny disclaimer on the menu, couldn't help feeling totally ripped off . Such a pity that our first experience of Lebanese food had to be spoiled by people so desperate to recoup their costs by forcing you to pay extra for a service that you dont really feel you got. One of the best Lebanese I had . the BBQ ,especially the veal chop, are exceptional. The Mezza is very tasty . This is the best Hommous and Tabboulah we had. The atmosphere is very nice and the staff are friendley. All in all our meal came to thirty pounds each including wine which is very good value for money. I will defintley go again. Went on a bank holiday Monday at 8pm which should have been peak time. Place was totally empty. This should have been enough warning to us. A cockroach walked passed our table when we were eating. None of the tables had napkins. When we asked for one we were given a tissue box. The food was ordinary. Nothing special. Felt ripped off when we were given the bill. They charged us for bread that we hadn't even asked for (cover charge) and then slapped 12.5% service charge onto the bill at the end. Never going back there again. EVER! You couldn't help but feel ripped off at this restaurant - despite the good food. Not only is there a £1.50 cover charge, but a non-discretionary service charge of 12.5% plus a minimum spend of £25 per person and if one person wants a set meal, then the rest of the table has to have it too or else they weren't allowed it - bizarre! There were also four widescreen TVs playing football, which wasn't conducive to an enjoyable meal out. This was one of the best Steaks we ever had. The B.B.Q are out of this world especially the Veal Chop ( highly recommended , you will never have a better one ) which is enormous and very jucy with a delicious aroma of the charcoal. All traditional lebanese dishes are also top. The homous and baba ghanoug are the best we had. we were 8 and paid about 35 each for plenty of food and wine. it was great value. One of the best Lebanese restaurants I have been to. Excellent quality food. Great for entertaining. Completes the lebanese experience in style. Negatives are that they charge £1.50 per head as a cover charge. Service is not the best as the servers appear arrogant. Inspite of that, i visit this restaurant often becasue the food quality os very good. Fattoush Salad and Haloumi cheese in pita bread is highly recommended. I happened upon this restaurant while travelling in London with my BFF. It could not have been a better "mistake". The atmosphere is warm and inviting. There are candles burning on every table (caution-do not hold your menu too close to the flame). Your meal begins with a large bowl of raw vegetables which are fresh and delicious (no Ranch dressing). The food is served by a charming waiter called Saif (as in opposite of dangerous). Please try #1,2,8,11,& 16. These are all delicious entrees. Always keep a "do not want plate" on the side, in case you order something which does not please you. You must indulge in the delicious honey-drenched baklava for dessert. Also, for a change, try a cup of Lebanese coffee. It will REALLY get the juices flowing. Enjoy this traditional Lebanese food! P.S. Stay away from the bathroom!! !